Fun fun FUN! That's what I call my weekend. 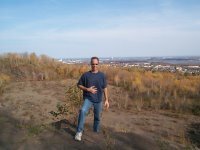 This Saturday I took the kids up to Duluth to "hang out," enjoy the amazing Fall colors and celebrate my brother's 50th birthday - and a better time could not have been had by all. 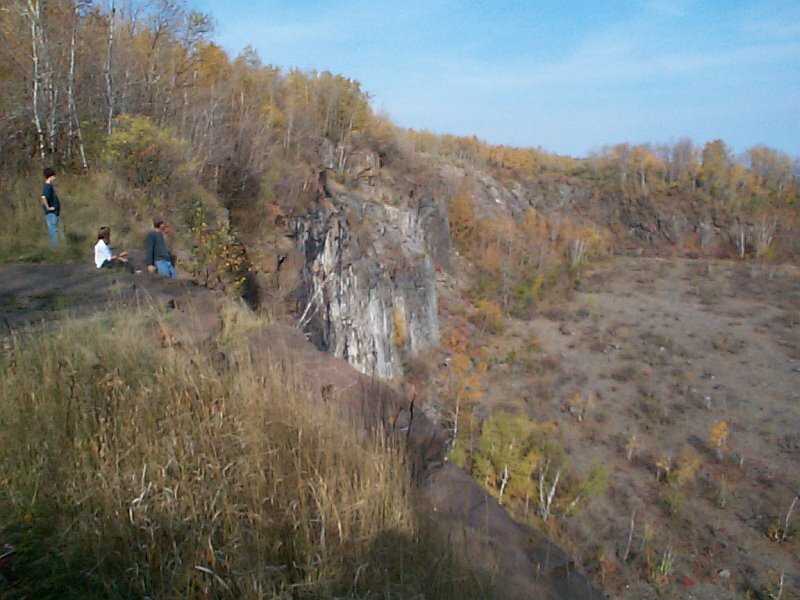 First up, a beautiful hike through one the newest legs of the Superior Hiking Trail that cuts right through the center of Duluth. 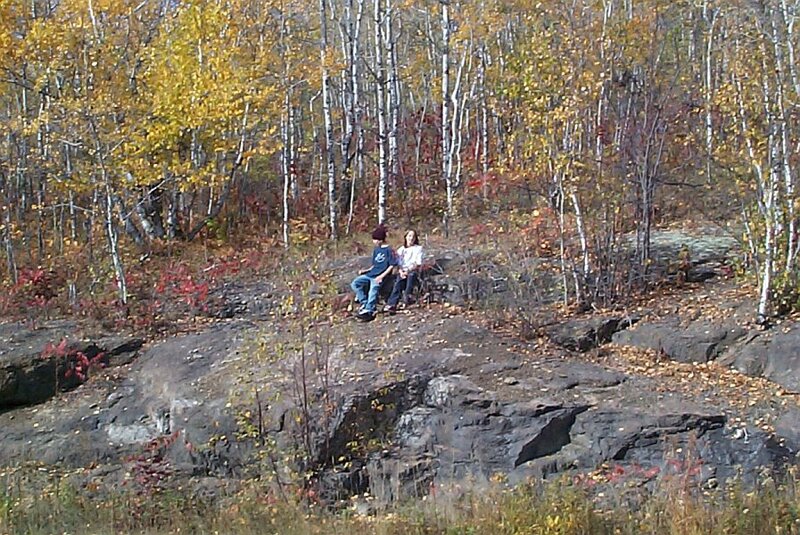 The entire trail will take you from Jay Cooke State Park just south of Duluth all the way up to Canada! 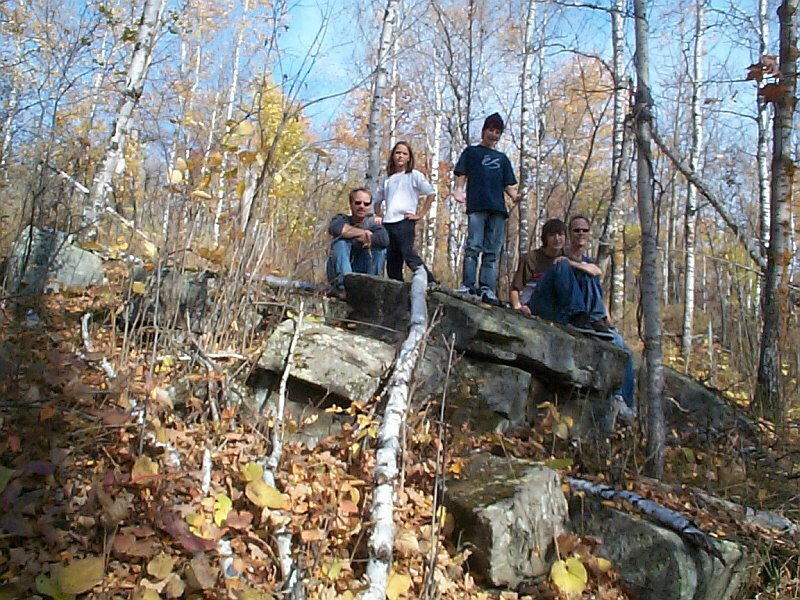 Here are some pictures of me, Rick and the kids taking a few breaks along the trail. 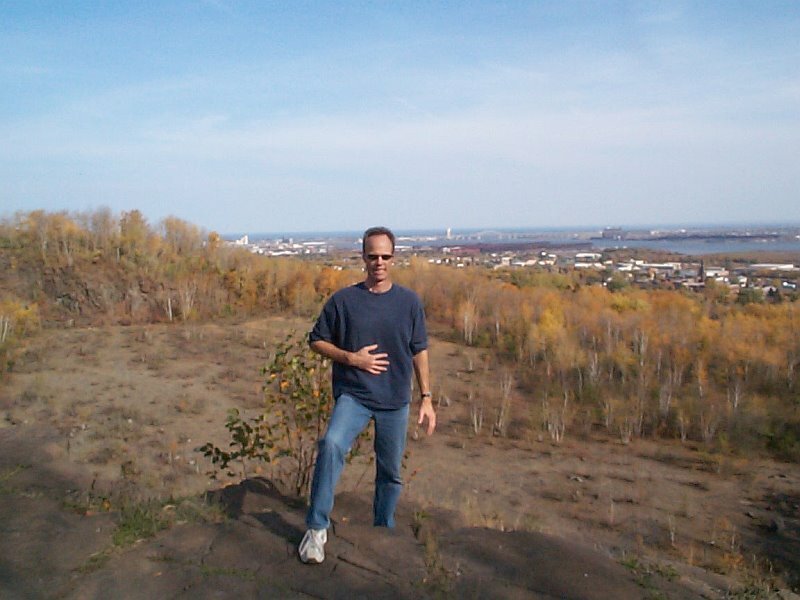 After our hike, we wandered down to "Casket Quarry" for a scenic overview of Duluth's harbor. 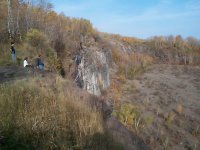 It was named for the fact that it once supplied rock for headstones - although it could be said that it was named for the stupid people who have died there while attempting to climb without using proper safety gear. Standing on the edge of the cliff with my stomach in knots. Bleh. 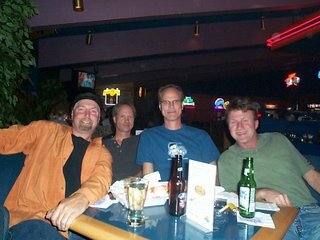 Then, on Saturday night Rick and I headed downstream to Tobie's Lounge in Hinkley where we celebrated his birthday with my two closest childhood friends, Mark and Neal. From the time we were toddlers these guys lived on either side of my house until we all graduated and moved on. Now I rarely get the chance to see them. But when we do get together, it's like time simply picks up where it left off. There really is no break to that kind of bond. Mark's band Freeride was playing at Tobie's and it was the first time I had seen them play. Later, when the band asked me to join them on a song, it was also the first time either Mark or Neal had seen me play harp. Considering I've been playing harmonica for over 20 years, this just confirms how rarely we get the chance to see each other anymore. Here I am with Mark, Rick and Neal doing my impression of a deer in headlights. Let's just say that at this point in the evening I was "comfortably numb," which, not-so-ironically, was the last song Freeride had played just prior to this picture. Wow, that is a great weekend. 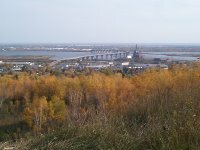 Time with the family, old friends, and Duluth in the fall. Love the pics! Linda - Mark was the one who used to live in your house until sometime in the early 80s. You may have even stumbled on remnants our of childhood - especially on the walls of the shed out back. We went back to the crick again this weekend looking for the G.I. Joe I lost when I was 8. Believe it or not we didn't find it. Huh. So that was some of your handiwork in the shed, huh? Cool. We painted the outside, but left the inside pretty much like it was when we moved in. My kids lost a few things at the crick, also. They used to go down and pick berries and come home muddy as heck and covered with mosquito bites. Man, they were little . . .
Love the pics. 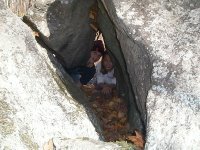 One of the few things I miss about New England is the fall foliage and crisp autumn air. Anywhere along Lake Superior is my favorite place in the world. I'm so glad you had fun. And Tobies sells the best caramel rolls ever made. 'Cept for my moms. You went to the crick? Who says "Crick" except for chiropractors? You went to the creek. Glad you had a great time with your brother. It's great to hang out with old friends again, isn't it?! 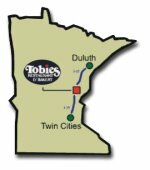 I've driven by Tobies many times in the years since I married Craig. We stopped and ate breakfast/lunch or something there only once...before kids. Whenever I see Tobies, I know we're getting close to the in-laws. Looks like you really had a great weekend. Too bad you missed the peak colors though...it really was beautiful. That trail looks fun. The beer drinking looks REALLY fun. And you have a standing invitation to comment whether I'm whoring myself or not. When will you post some music? Does your band have a website we can check out? carla - Thank you for asking! The very first link on my blogroll in my sidebar is for my band The Receders. The dropdown in my sidebar that's labeled "My Music Downloads" contains all the songs from my road band Livingston Fury as well as a few of my original tunes under Jeff Lee originals. Download them all if you want and enjoy! That looks awesome! Can I come over next time? 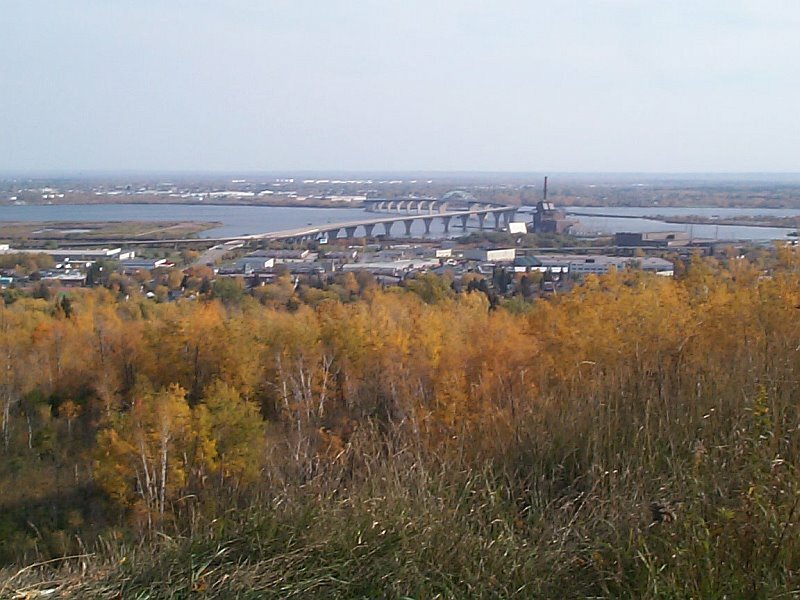 I miss Duluth. I've asked my wife to go on a vacation at Bluefin Bay, but she says if we do, she'll probably end up hitting me for moving to Arizona.